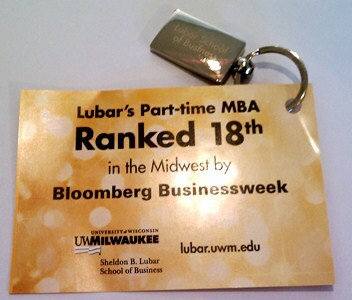 The part-time MBA program at the Lubar School of Business at University of Wisconsin-Milwaukee was recently ranked 18th in the Midwest by Bloomberg Businessweek. To celebrate and generate awareness for this honorary achievement, the business school wanted to throw a multi-day celebration where they would pass out some sort of tangible promotional product that would leave a lasting impression (opposed to just handing out a flyer), and inform people about this achievement. The school decided on going with a metal key chain which they could attach a small flyer to. They wanted the key chains engraved on both sides and needed the finished product in a short amount of time. Our creative team found an inexpensive yet high-quality metal key chain that fit their specifications and also had a very quick turn around time. The UWM logo was engraved on one side of the key chain and ‘Lubar School of Business’ was engraved on the reverse side. The key chains and the event were both a huge success and the school was able to propagate word of their ranking while generating positive buzz for their part-time MBA program quickly and effectively.